Mooi hoor, daar is ie dan eindelijk. De Tesla Model X SUV, die vijf jaar geleden al werd aangekondigd, is officieel gepresenteerd. Het nieuwste Tesla model, de volledig elektrische SUV van Tesla, is voorzien van vleugeldeuren en komt naast de Tesla Model S in de tweede helft van 2016 op de markt. De achterportieren, de vleugeldeuren, scharnieren als het ware omhoog en steken daardoor slechts 30 centimer uit. Hierdoor wordt het makkelijker om in- en uit te stappen. De bestuurder kan de voorste portieren automatisch openen zodra de auto wordt benaderd. Tesla laat weten dat Model X niet alleen de eerste volledig elektrische SUV ter wereld is, maar ook de veiligste met vijf sterren tijdens de NHTSA-crashtests. De Model X is voorzien van de ‘Bio Weapon Defense-mode’, waarmee schadelijke bacteriën en virussen buiten de deur worden gehouden. De Model X heeft een 17 inch touchscreen op het dashboard en een audiosysteem met liefst 560W en 17 speakers. De bijna 2.500 kilogram wegende SUV, die in de Tesla fabriek in Tilburg afgebouwd gaat worden, heeft een 90 kWh-batterij en komt in twee versies, de P90 (257 miles range (EPA est.) – 4.8 seconds 0-60 mph – 259 hp front, 259 hp rear motor power – 155 mph top speed) en detopversie, de P90 D (250 miles range (EPA est.) – 3.8 seconds 0-60 mph – 3.2 seconds with Ludicrous Speed Upgrade – 259 hp front, 503 hp rear motor power – 155 mph top speed). Tesla werkt ook aan een goedkoper model, de Model 3, die zo’n 31.000 euro gaat kosten. De productie van Model 3 moet over twee jaar starten. De Tesla Model X SUV is behoorlijk snel. Een sprint naar 100 km/uur in de Ludicrous Speed modus in de de P90D versie gaat in slechts 3,2 seconden. De actieradius van de Tesla Model X SUV is ongeveer 400 kilometer. Tesla Model X is the safest, fastest and most capable sport utility vehicle (SUV) in history. Standard with all-wheel drive and a 90 kWh battery providing 250 miles of range, Model X has ample seating for seven adults and all of their gear. And it’s ludicrously fast, accelerating from zero to 60 miles per hour in as quick as 3.2 seconds. Tesla Model X is the SUV uncompromised. Model X is designed with safety as the first priority. The floor-mounted battery lowers the center of gravity so that the risk of rollover is about half that of any vehicle in its class. The battery structure strengthens Model X against side impact intrusions. And without a gasoline engine, the large front trunk acts as a giant impact-absorbing crumple zone. Model X continually scans the surrounding roadway with camera, radar and sonar systems, providing the driver with real-time feedback to help avoid collisions. Even at highway speeds, Model X is designed to automatically apply brakes in an emergency. Pollution Free, Inside and Out. A medical grade HEPA filter strips outside air of pollen, bacteria, viruses and pollution before circulating it into the cabin. There are three modes: circulate with outside air, re-circulate inside air and a bioweapon defense mode that creates positive pressure inside the cabin to protect occupants. Falcon Wing doors allow easy access to second and third row seats from even a tight parking space, while traditional SUV doors or Minivan sliding doors would not grant any access. With only a foot of clearance on either side, Falcon Wing doors articulate smoothly up and out of the way, allowing passengers to enter from both front and rear directions. The side and overhead opening is so large that parents can buckle children in without ducking or straining and without bumping their child’s head on the roof. Model X is able to achieve 250 miles of range in part because it is the most aerodynamic SUV in production. At 0.24, Model X’s drag coefficient is 20% lower than the next best SUV. In addition, an active spoiler deploys from the rear liftgate to optimize highway efficiency and stability. Model X has the largest all glass panoramic windshield in production, providing an unparalleled view of the stars and sky above. Optimized solar tinting and obstruction-free view creates unlimited visibility for the driver and all passengers. Model X comfortably seats seven people in three rows. Every seat is the best seat in the house, but the second row seats are a work of art. Mounted on a single post and independently reclining, each second row seat is designed to maximize passenger comfort, legroom, under seat storage and access to the third row. The third row seats fold flat when not in use and the second row seats lean forward and out of the way for even more cargo area. 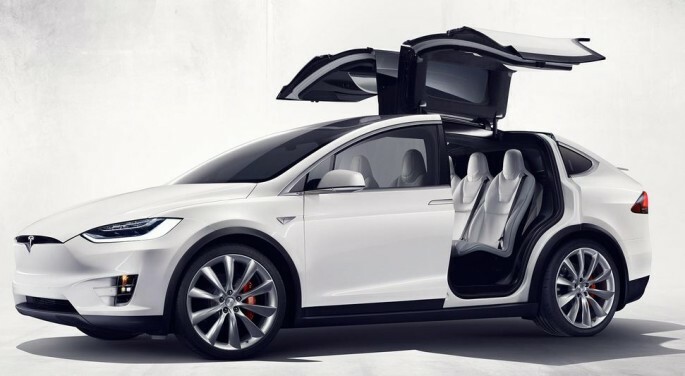 Model X is available in six-seat and seven-seat configurations. Seven-seat configurations maximize passenger capacity while six-seat configurations open second row seats to the third row and provide added cargo capacity. Soms zie je iets op het nieuws, waarvan je denkt: in de toekomst lachen we hierom. Om te laten zien dat we heus wel normale toekomstvoorspellingen kunnen doen, hier alvast de reclame voor de allernieuwste zelfrijdende auto. Over the weekend, with the Tesla Model 3 launch just a few days away, Tesla quietly changed some of the standard content for its Model S and Model X electric cars — as well as announced the retirement of the Tesla Model S 75 from its vehicle lineup. After wrestling over who got to drive their Model S each day, Paige and her husband decided to welcome a second Tesla into the family: a Tesla Model X. As a mom and video producer in Southern California, Paige needed a vehicle that could adapt to her ever-changing routine. Whether she’s using her SUV as a mobile office or a family caravan, Model X helps Paige balance her unpredictable production schedule with her number one priority, family. The Tesla Model X has been winning some impressive awards and accolades lately. But is the all-electric SUV really the ultimate unicorn — a futuristic family car for the fashionista? Nedahl Stelio attempted to answer this question when she recently reviewed the Tesla Model X for fashion magazine Marie Claire. The cantonal police of Basel-Stadt will replace the diesel vehicles for the alarm labels with electric Tesla Model X-100D which satisfies both economical and environmental protection, due to high payload and plenty of storage space, as well as very good handling characteristics for use as an alarm pickup vehicle. The total cost of ownership (TCO) is lower, despite higher initial cost compared to today’s cars. The planned replacement of diesel combined vehicles with the Tesla Model X-100D brings several advantages in terms of economic efficiency, practicality and ecology. In view of the exemplary role of the administration aimed at environmental protection in the Cantonal Legislative Plan 2017-21, the cantonal police has clarified whether a fully electric vehicle is available and suitable for the alarm signal on the market. A thorough investigation and practical tests have shown that the Tesla X-100D meets the requirements. Tesla has now decided to discontinue the 75 kWh battery for its Model S sedan and Model X SUV as of January 13. The announcement came in a tweet from Elon Musk on Wednesday and gives customers only 5 more days to order a car with that battery. Raising the price of its large cars hardly seems like a strategic way to boost sales, so the company must have something else in mind to encourage demand.